A while ago I wrote a review of Plaguers, a very entertaining throwback to the alien-clones of the eighties. I enjoyed it so much that I decided I needed an interview with the director Brad Sykes! So I wrote him an email, and soon I had some very detailed answers on my questions, so detailed that I had to split this interview in two parts - and here's the first part. I will publish the next one tomorrow. First of all Brad, it's a pleasure to let us know a little bit more about Plaguers and your career. But first just a basic question, you directed your first widely distributed film in 1999, Camp Blood. Can you tell us more about the production about that movie? Did it even have any budget? :) Did it open more doors to make more movies? Thanks for having me, Fred! Camp Blood was actually the third movie I wrote and directed, but as far as most people are concerned it might as well be the first…the first two movies I did, Scream Queen and Evil Sister 2, are pretty hard to find. Whereas Camp Blood showed up everywhere! If you had told me in the spring of ’99, when we were shooting it, that Camp Blood would be released around the world, have two sequels, and I’d still be talking about it today, I wouldn’t have believed you. Camp Blood started with a phone call from a producer I had done some work for in the past. He had hooked up with a company that was developing the first video-based 3-D technology – lenses and glasses - for video cameras and TVs. The idea was that you could use their lenses to shoot your own 3-D video, then watch it at home with the glasses. The company also wanted to make a few 3-D movies to support their new products. Horror was a natural fit for the gimmick, and they had committed to financing (appropriately) three movies. I was told to write something that could be shot mostly outdoors during the day, as it would be “easier” for the 3-D lens, which severely cut down on the amount of light let into the camera. Also, I was to incorporate as many 3-D “gag” shots as possible. Based on that, a slasher film seemed like a good idea. We could shoot in the woods, and use the 3-D to good effect during the various kills. So taking an obvious cue from Friday the 13th, I pitched “Camp Blood”, everybody loved it, and we were off and running. I immediately started writing what I decided would be my homage to a lot of my favorite woods-based slashers, stuff like The Burning and Just Before Dawn. The only problem was there was no money, and very little time, to put everything together! We had one casting session at the producer’s office, which was so far from L.A. that barely any actors showed up. I’m not kidding when I say that just about anyone who auditioned that day was cast. 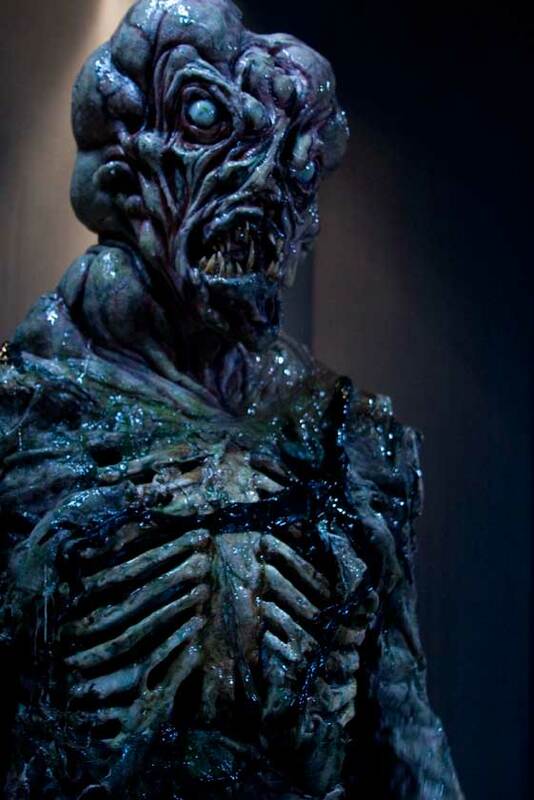 The special FX budget was really low, so I hired a recent makeup school grad, a guy named Justin Nelson. It was his first movie, but he did a lot of good work for pennies. We became good friends and I hired him on a few more movies, when we had bigger budgets, later on. The Camp Blood shoot took place in March 1999 over six or seven days, in the San Fernando Valley. We shot most of the movie in some woods located right off a freeway. This presented some challenges both audio and framing wise since “Camp Blood” was supposed to be deep in the wilderness and we didn't want to see or hear the cars going by in the background! But the woods location had its upside, too. Most importantly, it was free, and had some nice features, like the waterfall that I used in one of the main fight sequences between the male lead and the “clown”. The shoot itself had its ups and downs. We had to cancel a few days of shooting due to rain. We got kicked out of locations by local police. One of the actresses was a real diva who one day, wouldn’t come out of her “tent” in the middle of the woods until the producer appeared with a cup of hot tea! Another one of the actors got in a serious car wreck on his way to set but somehow showed up unscathed. And the less said about “the clown” the better; it was basically a part no one wanted to play, so we finally ended up having another FX artist friend of mine do it. He wasn’t too good at “pulling punches” and accidentally punched the lead in the face at one point! As down and dirty as the shoot was, my memories of Camp Blood are overall pretty positive. I met some cool people and for the most part we had a pretty good time shooting it. And it was my first film to achieve wide distribution and was very successful, especially for such a “microbudget” movie, so it did help open the doors for more movies, one of the first of which was the inevitable sequel! In my review of Plaguers I mentioned I disliked Camp Blood, but since then I've been rewatching it and appreciated it more this time. I don't remember the reviews from the time of the release, but it's been once of those movies that showed up everywhere I think. Before this Camp Blood, did you do other feature length movies that was never released or "just for fun"? Or short movies? The reviews for Camp Blood were really mixed when it came out. I remember it was my first movie to be reviewed in Fangoria and they hated it, said it “generated less suspense than a Scooby Doo cartoon”! Then there were other people who really enjoyed it, slasher fans like me who had a sense of humor and appreciated the effort we put in. There’s a book called “Legacy of Blood” that’s basically a slasher film compendium, and they really dug it, said it was “a nice change of pace from all the bloodless Scream-type slashers at the time”. I’m not saying Camp Blood is great, but we all worked hard to make something out of nothing with that movie and in that sense I am proud of what we were able to pull off. But you’re right, whether people loved it or hated it, it started showing up all over the place. And it’s still got pretty good circulation for a title that’s now 10 years old. It still gets re-released somewhere in the world every year or so. A friend of mine in Germany recently sent me a Camp Blood/Camp Blood 2 “double feature” DVD that came out over there last year! As for my earlier work…before moving to L.A., I made dozens of shorts and eight feature-length projects (I hesitate to call them “features”) on Hi-8 video with my friends during high school and college. These were pretty ambitious and got us in the local papers. They also got us a few rides in the back of police cars, too. The last of these features, a supernatural horror film I made in 1995 called The Pact, was my “showpiece” when I moved to L.A. in 1997. It got a nice review in Alternative Cinema magazine and later on, got me my first “pro” directing job, Scream Queen. Scream Queen was a great learning experience, but was way too ambitious for its limited budget. I did get to work with “scream queen” Linnea Quigley in it, though, and she was really cool and supportive; that was probably the best part of the whole experience. Scream Queen was released on VHS and is pretty much a lost film nowadays. My second movie, Evil Sister 2, I am actually very proud of. We shot it in the Mojave desert and achieved some pretty cool atmosphere and very graphic murder sequences. Imagine Jean Rollin making a snuff film…that kind of describes the vibe we captured. It’s available on DVD and not that hard to track down online. Both of these movies were shot in 1998 but not released till years after Camp Blood. One thing that I appreciated a lot about Plaguers was the eighties-feeling. As a fan myself of Corman-productions like Forbidden World, Galaxy of Terror... yes, even The Terror Within, I felt at home directly after just a couple of minutes watching Plaguers. What was your inspirations? I’m glad you got all that! We wanted to make an old-school eighties-style horror/sci-fi movie that felt like it could have been made back in the day, when creatures were made of latex, spaceships were miniatures, and sci-fi/horror films were actually set in space! 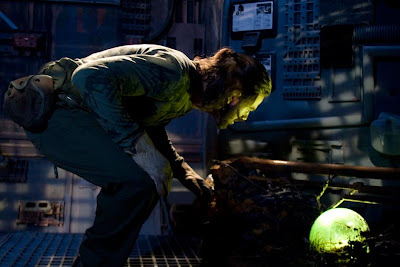 My inspirations for Plaguers stretch all the way from the “classic” sci-fi/horror films of the eighties - like The Thing or Aliens - to the less reputable Corman films you just mentioned, along with older films like Planet of the Vampires, The Green Slime etc. I love them all, in fact I have The Terror Within in my video collection! There are other non sci-fi movies that I was inspired by too, for example Demons was a big one, from the look and behavior of the plaguers to the Claudio Simonetti—inflected main musical theme. Heavy Metal is another, specifically the “B-52” segment. And finally, if I had to pick one filmmaker whose work had the biggest influence on Plaguers, it would be John Carpenter. Specifically Assault on Precinct 13, The Thing, and Prince of Darkness. Not just visually and musically, but in the pacing and general “attitude” of the characters and dialogue. On some level, all these movies were swirling around in my mind when I wrote the script, which was centered around an idea I had never seen anyone do before: zombies in space. The computer-screen graphics was also very, very retro. Loved that. How did you work with the design of the movie, and did you and your team do a lot of research, watching old movies and so on? I’m glad you appreciated that. The design of the entire movie, on some level, grew out of the sets that we ended up shooting on. Years after writing the script, I found some old spaceship sets lying around that were built in the early nineties, but looked more like they were left over from a seventies or eighties sci-fi movie…I felt like I had literally walked into one of those films. At that point, the sets themselves became an inspiration, pushing the movie more and more in a retro direction. Everything followed suit: the prosthetic FX (which I love anyway), miniature ships, costumes, the computer displays, etc. Some of the team – like myself and the FX guys, for example – didn’t need to do any research. This stuff is in our blood. Vicky Avery, our costume designer, also has a encyclopedic knowledge of genre films past and present, and we intentionally wanted the pirate girls’ costumes to have an iconic 60’s look, like something from Planet of the Vampires or Barbarella. Our production designer, Scott Enge, hadn’t seen all the reference points, but he really wanted to capture the look I was after and would ask me for movie recommendations, and he would watch one after another…Battle Beyond the Stars, Android, Lifeforce, etc. He had to build quite a few new sets for the film, and really did a wonderful job matching the stuff he built with the old ones that were standing. My discussions with our DP, Scott Spears, when talking about lighting and framing, were all about maintaining a certain naturalistic, carefully composed quality that I associate with older movies like Aliens or a lot of Carpenter’s stuff, as opposed to the quick-edit, jittery, saturated look a lot of horror films have today. It was really important that everyone be on the same page so we could get the look and feel I wanted. A special treat (again) for my readers! A new upcoming classic from The Asylum! The Best Horror Movies Of The Decade! What if Laird Cregar didn't die so young? At last, I ordered the Bronx Warriors Trilogy! Please, can someone translate Thai titles for me? Some signed photos from The Sci-Fi Convention! The ten most popular posts the last month!